Call the others, Optimus is drunk again. Right, that's the truck parked. Time for another beer! "Find the blonde that did this"
ow that hurts me looking @ this pic! ..and they say women can't drive..
Easy ... easyyy ... how am I doing on that side? is there a reverse gear on that truck? actually, the semi and the trailer are two entirely different vehicles. One drove the trailer up there and the other backed into the space. Can't say it was his fault, I don't see a "no U-turn" sign. 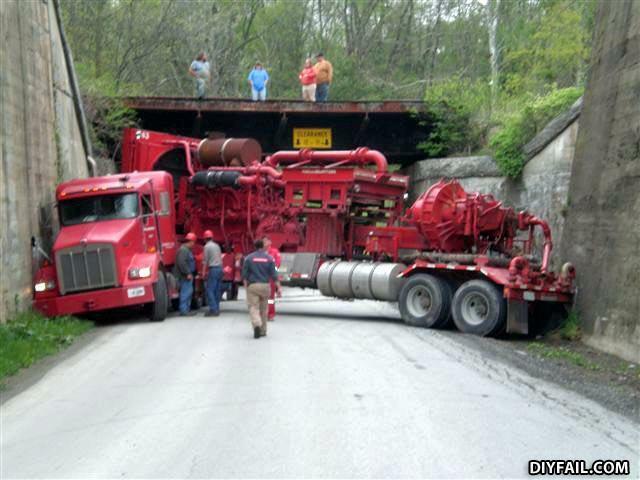 Optimus Prime's retarded brother Larry. is it just me or does that bridge look like it's bowed in the middle? Did the truckdriver forgot his lunch? Did he want to turn back home to get it? Optimus Prime divided by zero. Fairly standard. Halliburton are good at F@#king up. That's coming out of your paycheck! "oh, back up.... youre good.... dumbass." If you combine the weight of everyone in this picture, it will be equivalent to the weight of the truck and its load. what the driver wanted to do??? NOOO, i fear dark tunnels!